LIC Policy Status through Phone is the cheapest method for checking the status of any policy. Because it allows the policyholders to check their policy details, without logging into the LIC portal. By following this method, the insured can check LIC of India Policy Status without Registration. Hence, by providing your policy number you can get all the details of your policy. 1.2 How to Check LIC India Policy Status without Registration? Using LIC Policy Status through Phone service, the policyholder can check their policy status without registration. Life Insurance Corporation has started this facility to help the customers stay updated about their policy details throughout the policy term. Hence, by making a call to the Toll-Free number, you can get the complete information regarding policy status such as Bonus, premium amount that you need to pay, and other details. If you want to check LIC Online policy status, the registration process is required. Whereas if you want to check LIC Policy Status by Phone, registration is not required. Along with this method, you can also check the status of policy without registration, i.e., LIC India Policy Status through SMS and by visiting the nearest branch office. But visiting the LIC branch office to check policy status is the long procedure to follow. So, instead of that, you can just check LIC of India Policy Status through Phone Call. LIC Corporation of India offers 24×7 IVRS (Interactive Voice Response Service) calling facility. The Helpline numbers for checking the LIC Status by phone is mentioned in the above table. If you are an MTNL or BSNL user, you can make a call to 12151 and check the status of LIC policy by providing the policy number. In case if you are a landline user or mobile user of other networks, then you should dial your residing city code followed by 12151. Hence, in this way, the policyholder can check the LIC Policy Status through Phone easily within minutes. How to Check LIC India Policy Status without Registration? 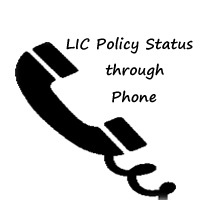 You can know LIC policy status through Phone just by dialing to L.I.C. Helpline Number 1251. If you are making a local call from any BSNL or MTNL simply dial 1251. STD code is not required. By calling you can know your L.I.C. Premium position, Bonus, revival of lapsed policies, Loan, etc. IVRS facility of LIC is available 24 x 7 in the following cities. The above mentioned are the LIC Customer Care Toll Free numbers. These are helpful for all the policyholders across India to check LIC Payment Status by Phone. Hence dial the relevant number and know the status of LIC Policy. My policy no.is 675825635. ..pls will u give me my status information. sir i m out of country . plz check my policy status. policy no.479128727. sir my policy no 434158438 maturity DAT 28 April 16 I already send my all doucoment I want to know my document already submeet ? My Policy No. Is 682072824 of Rs. 1996.00 is due on 28/06/2016. since I am paying Quaterly. Pl change it in Annually, I will pay full Annual amount. Sir, My policy No. 500891532 (Children Money Back Policy) have been matured and have received first 20000/- last year. However, next due money has not yet been credited in the account no of Syndicate Bank already provided to your esteem office. I am in need of money for my child and eagerly waiting for that to be credited at earliest. Pl look into the matter as why the next due money has not been sent to me till date. I sri. Jeevan Mining is one among of the customer of your Insurance Company since year 2008, with policy Jeevan Saathi bearing its No. 443458366 dated 22/05/2008. Elsenow, I’m in need of detail upto date status of my policy as earlier no alert message been channelled. Sir, My policy No. 563640094. I have deposited premium of Rs.2000/- through online dtd. 21/06/2017 vide payment Id JHMP5444418561, Lic Order No.03555690 amount deducted in my bank account but premium receipt till date not received. please confirm the premium payment status.